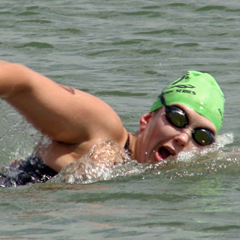 London - Jessica Roux of South Africa has dropped out of the women's 10km open water swim on the fourth of six laps. She had fallen well off the pace in the grueling race at the Serpentine, a lake in Hyde Park. Earlier, Fang Yanqiao of China withdrew because of an injury sustained before the race. A release announcing Fang's pullout did not give details of her injury. Twenty-three swimmers are now competing in the race, which first became an Olympic event four years ago in Beijing. Eva Risztov from Hungary won gold in a time of 1:57:38.2. Haley Anderson of the United States finished in second place to take silver, with Martina Grimaldi of Italy third.